Three kids in three different decades are forced to leave their homes in order to have a chance at a better life. Josef is a Jewish boy living in Germany in 1939. When his father is returned to their family after spending time in a concentration camp, the family takes advantage of a Jewish relocation plan. They board the St. Louis, bound for Cuba. 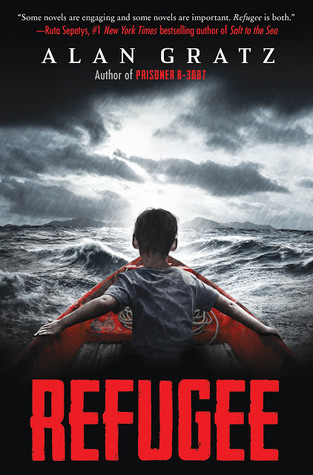 Josef and his mother are happy, dreaming of a better life without persecution in a new country but his father is scarred by his experiences with the Nazis and it seems that some of the Nazi persecution has come with them on the ship. Isabel has lived her entire life in Cuba under Fidel Castro's oppressive reign. When Castro says he will not stop Cubans who want to leave, Isabel's family joins their neighbors in a small boat to try to get to the United States, just 90 miles away. But before they can reach freedom, they must survive days at sea, sharks, dehydration, and the risk of being returned to Cuba by the American Coast Guard. Mahmoud has learned that the best way to survive the dangers in his city of Aleppo, Syria is to make himself invisible but even keeping his head down doesn't help with the bombings that destroy his apartment building. Mahmoud's family starts a long trek to Germany that involves lots of payouts and dealings with people who don't have the family's best interest at heart all while their plight is ignored by much of the world. Alan Gratz is fast becoming one of my favorite authors. His most popular books deal with oppressive times and atrocities but he never relies on the horrors of the time period to do the work for him. His writing style is calm - understated - which allows the reader to come to realizations along with the characters rather than telling us what to think. Refugee does this beautifully. All three families begin their journeys with hope and we as readers are led to believe they will soon be able to resume their normal lives in a better place. But the danger and despair slowly grows for all of them. Although they are separated by decades, their stories are very much the same which, I think, makes Mahmoud's story perhaps the most powerful for teens accustomed to hearing about bad things that happened in the past. Mahmoud's family makes their escape with the help of cell phones and Google maps, clearly illustrating that these situations are not removed from us by time, only by our luck to be living in a safe place. Another thing that I appreciate is that Gratz does not tie everything up in a bow. So many books for children and teens go for the happy ending or pull their punches with the bad guys. In Refugee, each family suffers some serious, realistic losses so that even those families that manage to make it to safety do so with some sadness. Finally, I am always excited to learn something new even as I am stunned by how much I don't know. Neither my husband nor I had ever heard of the St. Louis. Although it is an awful story, it is fascinating. Another great book by Gratz that I will definitely be using in reading programs at my school!